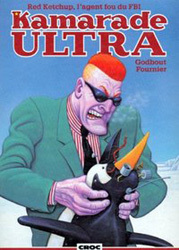 Red Ketchup was a character from a satirical Québec magazine called Croc. Originally conceived as a bit player, he ended up being so popular that he got his own series. I’d read some of the books before, including this one, but I recently got a chance to revisit it for old time’s sake. Admittedly, I got a few laughs out of it right from the onset: it is absurdly violent, taking the most ridiculous aspects of ’80s action cinema to another extreme. Watching a commie-hating, superhuman FBI agent slaughter packs of penguins to weed out a Communist spy was outrageous beyond belief. However, given that this was released right before the fall of the USSR, when Cold War tensions were still quite palpable, and since moronic action films were becoming more violent and popular at the time, this all makes complete sense contextually. And, as satire, it’s funny. But the amusement lasted only so long. The texts are surprisingly well-written, using a language I have not seen in comics in years, but the story fizzled out about halfway through – after which point it felt as though the authors ran out of ideas and were mostly coasting along long enough to get Red Ketchup into Moscow for a requisite rampage. The artwork is along the lines of Tintin in style, although it isn’t nearly of the same quality as Hergé’s long-running series. The influence is unmistakable, though, and is quite welcome – one could hardly criticize Tintin for its artistic value. Sadly, this book was a low-budget production and, thus, the colouring lacks verve; this could have looked far better. Still, as a whole, it’s a decent enough book. It’s not a classic nor is it a great work, but it has enough going for it to warrant giving another volume of Red Ketchup a gander – if only I could find them somewhere. Almost twenty-five years after first being published, I can’t imagine that the rest of the series will be easy to dig up. That’s a shame, actually: I could always do with more rampaging FBI wackos.